We’d love your help. Let us know what’s wrong with this preview of Наръчник за оцеляване в живота by Bear Grylls. Животът сред природата В „Наръчник за оцеляване в живота“ Беър Грилс споделя поуките, научени по трудния начин на някои от най-суровите места на планетата. To ask other readers questions about Наръчник за оцеляване в живота, please sign up. My fourteen year old brother loves Bear Grylls. Would this book be age-appropriate and acceptable to give him as a gift? Life’s journey and path is full of ups and downs, yet a strong heart pushes forth for success in reaping those rewards. Extreme hardships, tough battles and dangers can be fought and overcome - - when we choose to seize the moment, face our fears head on and rely on instinct! Living a purpose-driven, impactful life can be challenging and sometimes we need a guide…Bear Grylls inspirational, empowering almanac incorporates personal life lessons of indispensable worth and unforgettable value. “It might be dusty and hidden away, but it is there somewhere inside you: the heart of a survivor. This truly motivational read will help you to strive forth with renewed energy and zeal for life. It is not about perfection or presenting you with a list of things you must do in order to find fulfilment and happiness, but rather it is a book to highlight those errors that we can make which hinder our progress and cloud our vision. Having recently been through serious illness and incredibly dark, challenging times I was struck by how with such acuteness and poignancy each statement/ quote and connotation “hit home”. I now feel as a consequence of reading this more focused, positive, optimistic and reassured and strongly believe that I have grown in character through my own personal experiences in life. Life is short. It is precious. Make the most of it; live your dreams. Seek out adventure. Love life; nature, people, places, culture and intelligence. Work hard and accept the rewards. Climb the highest mountains and never look back! I know some people say it’s not what they were expecting but it was for me. He managed to talk about surviving in life and in business and well as in adventure. Some also said that his quotes were “corny” or “cheesy” and I respect that’s their opinion for I didn’t feel that way at all, I felt that those quotes will stick with me as well. Quick and fun to read. * Success requires sacrifice. Get used to it. * Money is also like a river, and rivers need to fl Great motivational book. Изключително приятно ме изненада тази книга! Имаше много съвети, които си записах, или си казах просто, че е хубаво да започна да правя нещо. Лека, приятна, мотивираща и вдъхновяваща! "A stitch in time saves nine" , "If life gives you lemons..." like this book! Сборник от съвети за живота от типа на "бъди ентусиазиран", "никога не се предавай" и подобни мъдрости, които виреят добре във фейсбука на фона на снимки с висящи от простора котенца, като всеки от съветите е развит в кратка глава от по страничка-две. На места размислите са подправени обилно с библейски цитати и поощрения да се довериш на Христос, защото той знае най-добре... Глупаво. Inspiring and engaging! I learned a lot and was encouraged to do greater things. It was definitely not preachy, but felt friendly. One of the best motivational books ever! Short and easy to read. Full of inspirational stories, words of courage and wisdom. Filled with cliche, it was often cringeworthy. A disappointing read. This book fits into the 'book written in the last three years' category on the bingo board as it was published in 2012. This book is a great guide for learning " how to achieve goals, thrive in adversity and grow in character". It is a book written to help people learn to be successful in life or whatever dream they may have. Grylls shares secrets and different ways that helped him become an adventurer. In the book he talks about many different topics, failure, modesty, perseverance and many other qualities that i have learned are very important to achieve your dream. I really enjoyed the book as it helped me to learn a lot more about striving to meet my goals and dreams. My dream is to become a professional footballer and during my time playing football i have endured many failures and successes. This book taught me that "failure isn't failure" and that '" failure is a stepping stone to success. I have also so learn to never give up and keep going when the times get tough. I like this book as i think it can apply to all people no matter what dream they have. There are a lot of great quotes in the book that i found interesting and inspiring. Also in this book bears tells stories about his failures and successes . These stories are also very interesting and inspiring as they show that everyone makes mistakes and undergoes failures. Overall i loved this book and would recommend it to many people especially people who are having a tough time chasing their dreams and getting hit by a lot of failures. Wow! Recommended by a friend who was not a reader but loved this book. Every page full of good sense, good stories, good values and good words. Small bite sized chapters with a simple message in each. not wordy, definitely not complex. It got me so interested I went back and bought another of Bear's books. Too many good messages to quote but my fav is simply. " when in hell, just keep going." We are afraid to fail. Society and family teaches us to be 100% correct. Unless you're a robot that's quite unrealistic. Fail and fail. Colonel Sanders (KFC) was rejected 1,000+ times. There are millions of people out there who succeeded after embracing failure. Always take the first step. The journey of a thousand miles begins with one step. Each baby step makes bigger step overtime and brings us closer to our desire. Pain makes us stronger. We all feel it at some point. It is transitory. Our pride endures forever. If we want to gain something, we have to take risk. There's no quick fix. Sometimes we are afraid to make decision. But it's better to make bad decision than no decision. Enthusiasm adds the extra 5% sparkle to our effort. I was given this book for Christmas about two years ago. Since then, it has sat on my shelf untouched, gathering dust. The main reason was that I wasn't sure that I'd be all that interested in it, as well as the fact that it looked like a time-consuming read. However, you shouldn't judge a book by its dimensions. Despite being a large hardback copy, this could quite easily have been condensed down into a convenient pocketbook. The choice of font and formatting meant that "chapters" were no more than ~500 words at a time. Considering I haven't ever really thought a great deal about Bear Grylls, the two+ hours I had between finishing a college activity and beginning work appear to have been a greater blessing to me than I could have known. A saunter around the library brought me to the "Biographies" shelves, and I had no interest in music or political personalities. Instead, I elected to flick through this book, because as a recently enrolled scout leader it seemed blasphemous not to think much, if anything, of Be Considering I haven't ever really thought a great deal about Bear Grylls, the two+ hours I had between finishing a college activity and beginning work appear to have been a greater blessing to me than I could have known. A saunter around the library brought me to the "Biographies" shelves, and I had no interest in music or political personalities. Instead, I elected to flick through this book, because as a recently enrolled scout leader it seemed blasphemous not to think much, if anything, of Bear Grylls. Upon doing so, I found the to be quite concise. Something I'd be able to pass the time with. Never have I been so captivated and provoked into thinking by a motivational/self-help book. It came at just the right time, too, and I'll be sure to utilise some of the factors and advice included in this book. I don't know how to review this book without seeming snobbish, but here goes: this is a book written for a very specific audience--17-29 year old males who rarely read anything but might read advice from Bear Grylls. I don't think women would get much from it (it's clearly not really written to them), though the life principles are all transferable. But, having said that, if young men did read it, they would receive very solid advice which they could build their lives on. I agreed with virtually I don't know how to review this book without seeming snobbish, but here goes: this is a book written for a very specific audience--17-29 year old males who rarely read anything but might read advice from Bear Grylls. I don't think women would get much from it (it's clearly not really written to them), though the life principles are all transferable. But, having said that, if young men did read it, they would receive very solid advice which they could build their lives on. I agreed with virtually everything Bear said, but I found it hard to wade through all the cliches. I am still interested in reading his autobiography-- the best moments of the book were the stories he drew from his own mountaineering and SAS experiences. I have been reading Bear Grylls his book Mud Sweat & Tears last Summer. It really inspired and intrigued me. My dad gave me this book and said it was also very good. (I got the Bear Grylls fandom from him). I have to admit, this is really not your one of a kind self-help-book, but it's something much more, written by someone that actually knows what he is talking about. I think Bear is a true inspiration for a lot of people, and this book is very helpful to me, and I am sure it will be to yo I have been reading Bear Grylls his book Mud Sweat & Tears last Summer. It really inspired and intrigued me. My dad gave me this book and said it was also very good. 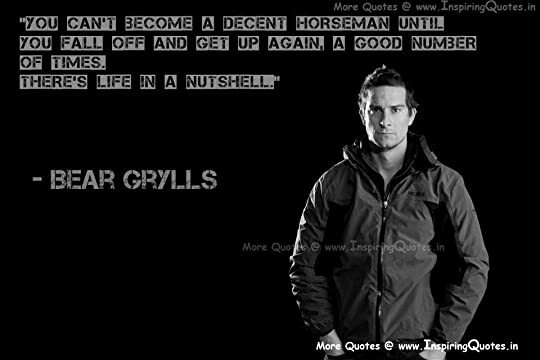 (I got the Bear Grylls fandom from him). I have to admit, this is really not your one of a kind self-help-book, but it's something much more, written by someone that actually knows what he is talking about. I think Bear is a true inspiration for a lot of people, and this book is very helpful to me, and I am sure it will be to you. I was looking for next book to read and my friend recommended this to me. I was quite sceptic in the beginning, but this book really taught me a lesson - never judge the book by its cover. The last thing I would expect from this book was to find so many relation to Bible, in very non-offensive format. But you do not need any faith or belief to read this book. It's full of live advices and suggestions and saying, which I will never forget as I wrote them down. I am handling it to my kids to read I was looking for next book to read and my friend recommended this to me. I was quite sceptic in the beginning, but this book really taught me a lesson - never judge the book by its cover. I really didn't know what to expect from this book as Grylls life is totally opposite to mine but i ended up enjoying it so much. Although he often talks about his adventures, you can forget about comparing those parts to your life. 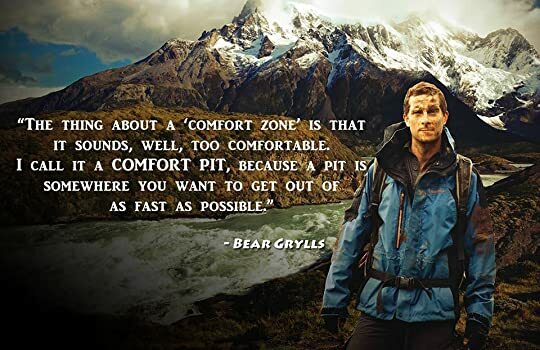 But Bear Grylls gives so much practical advice that anyone can apply to areas of their own lives if they want to, no matter what you do in life. Well worth a read and likely a book i will read again, maybe on a yearly basis. There’s nothing hugely new in this book but it is so good to be reminded of the positive principles of life. And what a story about Beck Weathers, the mountaineer left for dead by climbers, but who got up, got back to camp and who lost his hands and nose to frostbite. I’ll always now remember the importance of the five ‘f’s’; family, friends, fun, faith and following the dream. Such an easy read that reboots you with that ‘get up & go’! If you've never read a self-improvement book before, you may find this instructional. Grylls is writing for a fairly young audience but it's enlightening enough in terms of what makes him tick. As the poster boy for the Alpha course, Grylls isn't shy about talking about his faith or making biblical references throughout. I’ve read many self improvement books and really liked how Bear put his own twist on it. Even for individuals that feel they don’t have the time to invest in reading for bettering themselves, Bear makes it easier by making each chapter only 2-4 pages long. I’m sure this is a book I will reread many times over and appreciate it as much as the first time I read it. My rating is for how this book relates to me. I didn't really care for the style of this book. Lots of anecdotes taken from all too familiar sources with no real substance. Lots of positivity without the 'guidance' to apply the concepts practically. I'm sure Bear has examples he could share from personal experiences, but he barely (I know) went there. This book would serve as a nice intro to the self help genre, but for more substance I'd look elsewhere. I liked the straight to the point style of writing. I found some lessons and stories inspirational and some of the quotes resonated with me. I will reread this book every now and then, should I lose motivation in working towards my goals. I love that the book is structured in 1-2 page of wisdom that is relating to the wild outdoors , there is no room for fluff and each time I read it , it inspires me to take action and get out of my funk . This book is awesome. I really enjoyed it and I liked the format of the short chapters for each tip. A lot of wisdom, and practical ideas for living life well.